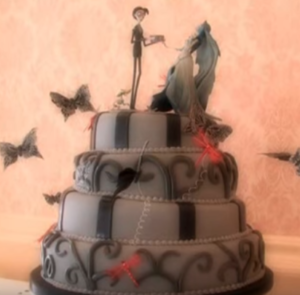 If you and your significant other think of Halloween as a lifestyle and are thinking of planning a Halloween themed wedding then you will love this video from Wedding TV, which was a lifestyle television channel in the UK that ran from 2006-2013. This particular episode features Dan and Stevie’s Halloween wedding that offered all kinds of Halloween inspired touches and was a lot of fun for everyone that attended. Dan and Stevie talk about how they first met (and Dan just happened to be dressed as a giant Squirrel) and how the relationship blossomed from there. And since they are both huge fans of Halloween it just seemed fitting to get married that day (and as look would have it, Halloween fell on a Friday the year they were planning to wed). From the quirky Steve Burton inspired (and surprising elegant) Halloween wedding cake cake to Stevie’s red Halloween wedding dress (with the coolest funky shoes), their wedding took 16 months to plan. And due to the theme of the wedding, finding specific items was sometimes a challenge. The wedding/reception venue was gorgeous yet still had that Gothic (and as one family member described, haunted) feel. And once it got dark out there were plenty of actors dressed in costume that put on a show outside to greet guests. This was both fun and unexpected and really set the tone for the reception. The colors chosen were traditional autumn/Halloween colors and a lot of pumpkins were incorporated into the theme as well. What really stands out to me about this day is how the guests were such a big part of this celebration. Of course, this is normal with any wedding but just the added touch of having character actors dressed in costume to greet the surprised guests really added a touch of fun. And the guests also dressed in costume for the reception, which turned this into a fun wedding/Halloween party that their friends and family all got to be a part of. This just goes to show that a Halloween inspired wedding can be just as classy and elegant as a traditional wedding. This entry was posted in Special Events and tagged Halloween inspired wedding, Halloween themed wedding, Halloween wedding, Halloween wedding cake on August 12, 2016 by Halloween Inspired.